Perfect for the beginner and enthusiast alike, the Compact Action Camera from Manfrotto will ensure you always obtain great photos and smooth movies. The Manfrotto Compact Action Tripod in black is the perfect companion for beginners and enthusiasts looking for a first-time tripod to match the weight of their entry-level DSLR with kit lens attached. 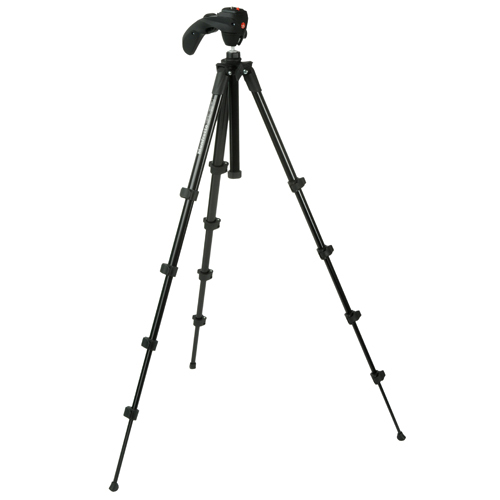 It's aluminium, 5 leg section design allows the tripod to extend to a maximum height of 155 cm (133 cm with centre column down) and close down to 45.3 cm, weighing only 1.2 kg makes it very travel-friendly. 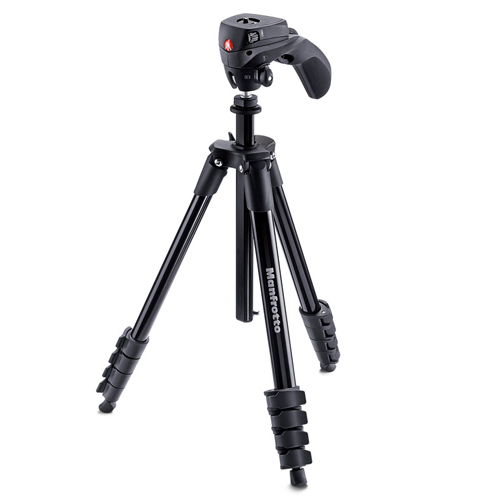 Manfrotto's Compact Action Tripod comes with an ergonomic joystick head with a scroll-wheel locking mechanism and comfortable grip, which allow users to make smooth, quick and easy adjustments. The innovative circular quick release plate with 1/4" screw is perfect for effortless camera attachment. Simply close the lever just above the joystick handle to change from landscape to portrait orientation. The Regulating Dial, together with the round QR plate allows you to perfectly adjust every camera to the tripod, thereby enhancing its stability. Maximum freedom in any circumstance is allowed by the photo-movie selector. Switching to the desired mode only takes a second and ensures you always obtain great photos and smooth movies. This tripod is intuitive and ready to use straight out the box.